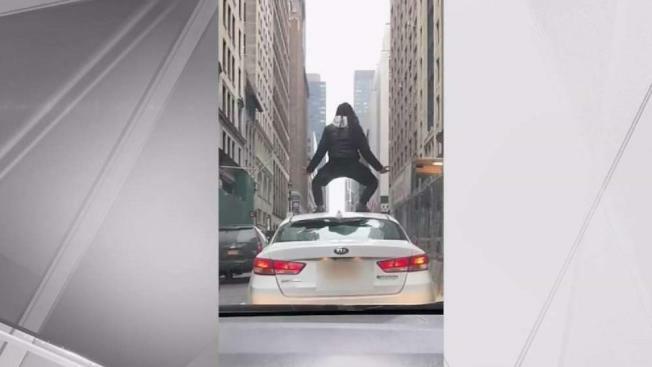 A man had a tantrum on top of a ride-share driver’s car in the middle of midtown traffic in broad daylight and the chaos was all captured on video. Police say a man with dreads was riding a bike Friday at around 1:30 p.m. at 40th Street and Fifth Avenue when he started banging on the car’s window for no apparent reason. The driver tried getting away from the man, who then pedaled ahead and hit the car with a U-lock as they were stopped in traffic. The blows smashed the windshield and rear window of the vehicle, police said. When the driver got out, the suspect hit the driver over the head and back with the bike lock. The driver got away from the man, but it was then when he climbed onto the car’s roof and stomped all over it while screaming at the top of his lungs, the NYPD said. He then leaped off and pedaled away on his green bicycle. The 23-year-old rideshare driver was treated at an area hospital for a cut to his head. He was later released. Police, however, are still looking for the suspect. There were two passengers inside the car at the time, but they were not injured, according to authorities.